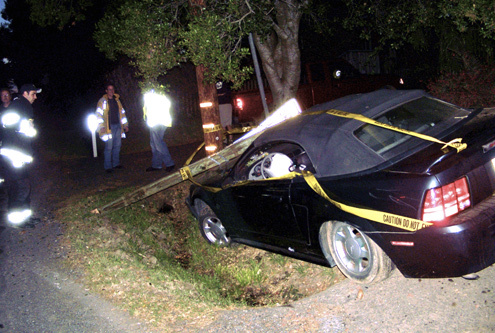 A Mustang convertible ran off Highway 1 near its intersection with the Point Reyes-Petaluma Road about 8 p.m. Saturday, caving in the front end of the car. It’s an all-too-familiar accident at this location. After overshooting a curve in the highway, the Mustang dropped into a roadside ditch and hit a speed-limit sign and a utility pole, causing driver’s side airbag to deploy. Apparently no one was seriously hurt. Residents living nearby said they saw people walking away from the scene, heading toward downtown Point Reyes Station. When firefighters and the Highway Patrol showed up, whoever had been in the wreck was long gone. For years, numerous northbound cars and motorcycles going too fast up Highway 1 have run off the roadway at the first curve north of downtown. 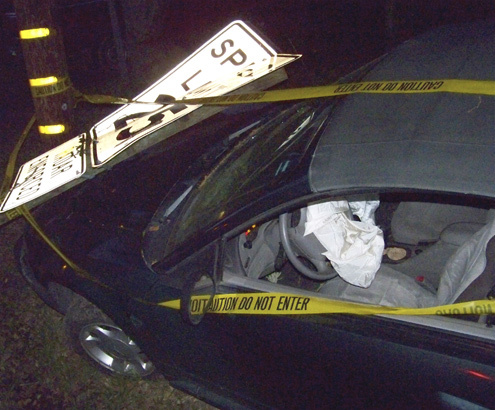 Terry Sawyer, who lives nearby, told me, “This is a once a week or once every two weeks thing.” Indeed, this blog on March 15 reported on a very similar crash, which also knocked down the speed-limit sign. The crashes “most of the time stop the car,” Sawyer said, but some vehicles manage to get back on the highway and drive off even when they’ve been damaged. One damaged Corvette made it all the way to Nicks Cove, leaving pieces of shredded tire all along the way, both Sawyer and a firefighter said. So far no one has been killed in crashes on the curve, but a number of speeding motorcyclists have been injured when they ended up in the ditch. Although the speed limit is only 25 mph on this stretch of highway through a residential area, Sawyer said he often has trouble pulling out of his own driveway safely. I don’t know what the solution is, but Caltrans clearly needs to do something to slow traffic heading north out of downtown. Sparsely Sage and Timely is powered by	WordPress 4.9.10 and delivered to you in 0.361 seconds using 52 queries.